Caption: This student from Success Laventille Secondary School, attempts to answer a question at the competition. The school advanced into the quarter finals which will be held on November 1. Port-of-Spain, Trinidad: October 29, 2014: As this country prepares to celebrate African History Month, in November, both Primary and Secondary Schools across Trinidad and Tobago, are moving full steam ahead, as they come up face to face with their peers, at the annual Emancipation Support Committee (ESC) and Republic Bank National African History Quiz and Spoken Word Competition. The competition which is in its sixth year, kicked off on October 18 and will continue until November 15. 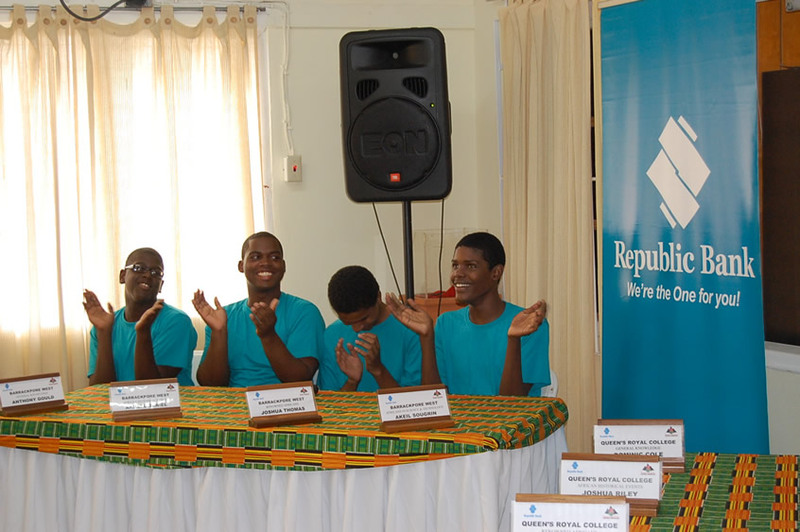 The preliminary rounds of the competitions, took place at the ESC’s headquarters in Maraval and at NALIS. The competitions got off to a thrilling start with over 127 students from 26 schools participating. Republic Bank, in its thrust to heighten public awareness of the contributions of Africans and celebrate our nation’s heritage, has once again partnered with the ESC to execute this programme. Students were quizzed in four categories: Africans in Science and Technology, General Knowledge, Historical Events and Renowned Africans. The Spoken Word competitors had to select poems or stories from local and foreign African poets and writers, including Lasana Kwesi, Pear Eintou Springer, Maya Angelou, Marcus Garvey and Nelson Mandela. Team Captain, Damien Maharaj, of St. Benedict’s College, was proud to share his team’s secret to success, upon advancing to the quarter finals. “We kept together. We did everything together. It was just harmony among us,” Damien said. He added that commitment and dedication were the keys to his team’s success. Asked how he felt about his team advancing, he glanced across at student representative, Nicholas Chambers, saying, “He motivated us and pumped us up, were it not for him, we would not have made it thus far.” The team garnered 450 points, beating their opponents Arima North Secondary School. Also sharing words of advice, after their victorious win, team captain, Anthony Gould, of Barrackpore West Secondary, said he was grateful to God for taking the team to the end and encouraged the other students to remember to put God first in all that they do. “God guided us and directed us. We are a great bunch of guys who have faith and trust in God. We are very happy,” said a confident Anthony. The team walked away with 800 points, beating first time entrants Queen’s Royal College, who captured 200 points in the competition. The other schools going forward in the African Quiz Competition are:- Success Laventille Secondary School, San Fernando West Secondary School, Princess Town East Secondary School, Arima Central Secondary School, St. Benedict’s College, Barrackpore West Secondary School, St. Francois Girls, Tunapuna Secondary and Fyzabad Secondary School. In the spoken word aspect of the competition, twelve students from five Primary schools, have advanced to the quarter final round of the competition. Judges for the 2014 competitions include Dr. Claudius Fergus, UWI Lecturer, Tracy Wilson, Director of Education, ESC, One Piankhi, Historian, Dr. Yvonne Bob-Smith, Lecturer, COSTATT ,Wendy Mc Kenzie, History teacher, Nzingha Salandy, Actress, the Strolling Players, Nikita Yearwood and Nicholas Sosa, poets, Circle of Poets and Damien Whiskey, Midnight Robber. The competition is also being chaired by television personality, Verne ‘Antix’ Extravour. 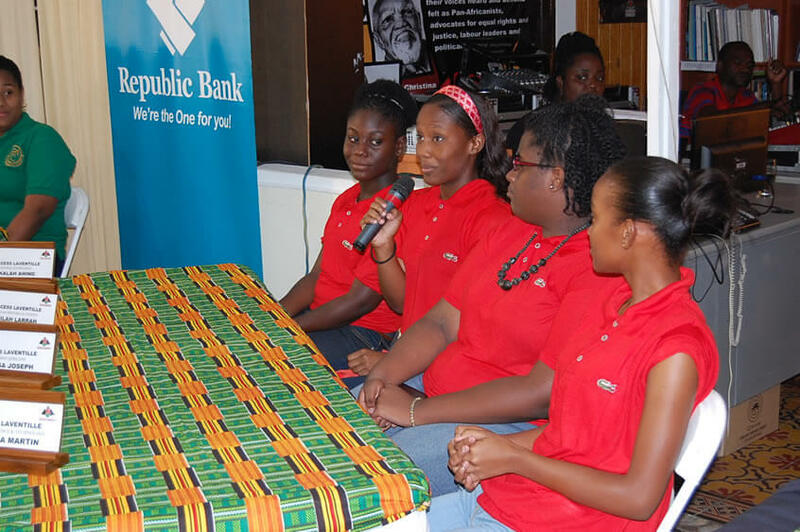 Through the Bank’s Power to Make a Difference Programme, Republic Bank remains committed to the development of our youth through education, sports and culture. We wish all the participants great success in the competition. Be viewing Synergy TV this November for the broadcast of the competition.